Expectations of a "repeat" can be both a blessing and a curse, but Coach Anna Bush knew that to accomplish that goal many things would have to go right. Her Knights were loaded with talent, but injuries, illnesses, a brutal schedule, early losses, and lack of early cohesion created a degree of uncertainty. However, as the season progressed, the team began to play better and better and showed no fear from game to game. 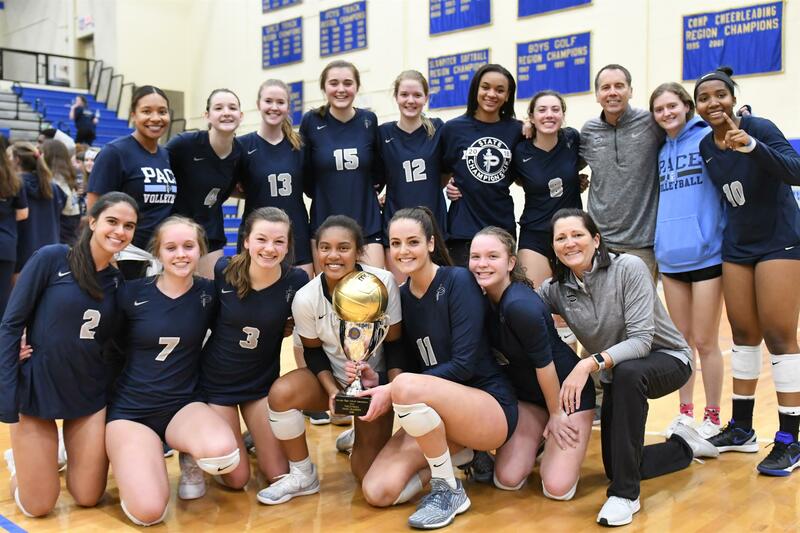 After rolling past Lovett in the semifinals with relative ease, there was a strong Westminster team waiting for a state finals rematch for the third year in a row. Both teams were evenly matched, and Coach Bush knew it would come down to who played better on championship day. In the first set, Westminster dominated almost every facet of the game, winning 25-16 and showing the rambunctious crowd that the Wildcats came to win. However, in the second set, the Knights made a couple of adjustments, including changing the lineup, and things began to click. The Knights won 25-20. The third set was still no picnic, but Pace emerged victorious again, 25-22. A fourth-set 25-22 win sealed the 3-1 victory. In the end, it was serving and passing that changed the game for the Knights. Senior Davis Mathis and freshman Morgan Neill both had strong serving runs. Junior Dominique Turner (22 digs) and senior Alexandra Baker (15 digs) passed and played stellar defense. Sophomore Kalissa Greene was magnificent with 35 assists and provided a constant attacking threat at the net. Junior Lucy Ferry had a huge game with 10 kills and some key blocks at the net. Sophomore Hannah Pace added nine digs, some of which were pretty amazing. The two dominant players were the Knights' outsides Baker and junior Ada Jane Agolli. Agolli had 15 kills (her final kill of the match was her 1,000th career kill), and Baker led the team with 19 kills. Baker plays all six rotations so it's easy to see how much her performance impacts the Knights' success as she saved her best for last on Saturday. Congratulations to the Knights volleyball team, coaches, trainers, parents and fans for another huge success. Is it too early to anticipate a "Three-Peat"? 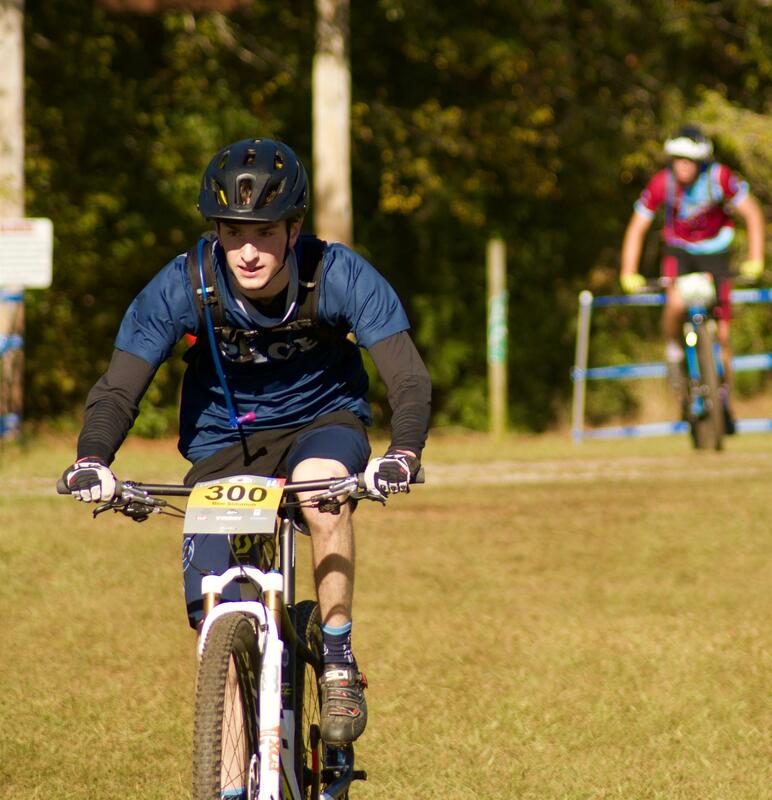 On Sunday, Nov. 5, the mountain bike team ventured south to Jackson, Ga., to compete in the final race of the 2018 season. Dauset Trails challenged the riders with fast singletrack, enormous roots and long sections of gravel. Yet, the weekend couldn't have offered better weather for riding. In the freshman boys race, Connor Vance led the Knights with a time of 58:09 on the 8.6-mile course, earning him a 49th-place finish in the group of 83 riders. Vance was followed by Jude Black, who finished in 59:32 earning a 57th place finish. In the sophomore boys race, Aiden Critz kept up his streak of top-10 finishes by completing the 8.6-mile course in 50:46. This time earned Critz a ninth-place finish in the group of 50 riders. In the JV boys race, senior Ben Solomon completed the 12.9-mile course in 1:17:26, earning him his best finish of the season. Solomon placed 22nd in the pack of 69 riders. He was followed by junior Ben Tolliday, who finished the course in 1:17:29 in 24th place. A huge congratulation goes out to senior Ben Solomon. Solomon was a member of the mountain bike team all four years of his high school career, putting in endless miles on the trails at Sope Creek...and devouring countless meals at Waffle House. Thanks, Ben, for all of your hard work! Happy Trails! The team is looking forward to hitting the trails again next fall! 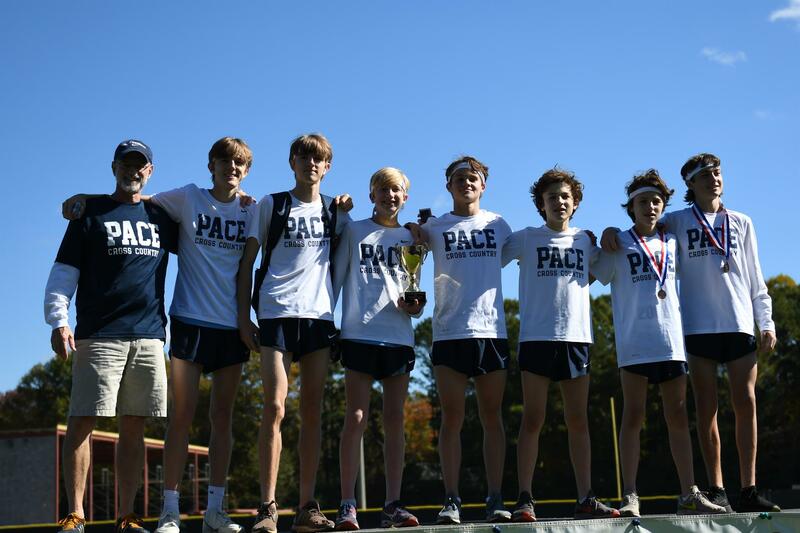 Saturday, Nov. 3, was the state cross country meet in Carrollton, Ga. AAA competition was hot in both the girls and boys races. The Pace boys started the day on the course. Junior George Adams led the way for the Knights as he had an individual 10th-place finish on the podium. Every Pace male runner ran faster on this course on Saturday than they did at a meet on the same course earlier in the season. Freshman Edward Blaha had an outstanding 13th-place finish. Junior Sam Adams, who had been running as the Knights' No. 5 most of the season, stepped up and ran No. 3 and had a great race. Freshman George Blaha finished three places behind Sam Adams, with junior Quill Healy rounding out the team's scoring five. Freshman Robert Mallis finished sixth, and Robert Houser was seventh. At the end of the race, when the points were tallied, this young squad who has run like seasoned veterans all season had put together a fourth-place team finish for the awards podium. The girls stepped up to the starting line next. Junior Paula Sandoval established her positioning very quickly in the race. When all was said and done, she was on the individual podium with a sixth-place finish. Sandoval was joined on the podium by freshman Laura Arenth, who steadily moved up during the race like a veteran cross country runner, placing eighth overall. Sophomore Laura Romig missed the individual podium by a mere four places. The Knights' fourth runner was junior Payton Payne, while Kat Hood rounded out the scoring five. Pace's top five girls were in the top 23 of the race. Romig had the finish of the day, sprinting down the last hill to hold off a Lovett runner. Freshmen Jordan White and Margo Kaye had outstanding races, finishing as the Knights' sixth and seventh runners. When the dust settled and the points were added, the girls secured a third-place podium finish. The coaches would like to thank the entire cross country team and their families for all of the hard work and support throughout the season. Parents provided snacks and drinks to feed 61 runners, dropped off students early in the morning on meet days and cheered them on at races. These student-athletes showed constant hard work and tremendous work ethic daily, which certainly paid off. Congrats on a wonderful season! Sign up for a volunteer shift during either girls' or boys' varsity basketball home games. Volunteering is a super way to meet and interact with others in the Pace community, show your support for Pace Athletics and fill a very important need. You can sign up by logging into myPACE and selecting BOOSTER CLUB under the PARENT VOLUNTEER section.